I don't even think we know if Enoch's fathered Methuselah yet, though that probably happened either during that time-skip sequence or even before the game starts. So who's this idiot with the crazy hair? As the title card indicated, that was Methuselah who's been following us around. Methuselah is the first son of Enoch, fathered when he was 165 years old. 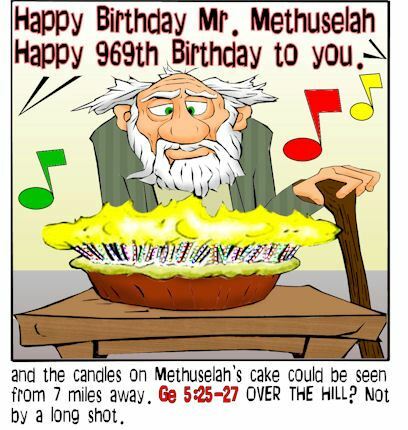 Methuselah is most notable for being the oldest person ever, clocking out at a very respectable 969 years. He died exactly one week before the Great Flood; God actually delayed the flood a full week to mourn Methuselah's passing. There's a bit of contention as to how literally Methuselah's age should be taken. Some say it's completely literal, explaining the dissonance between that sort of lifespan and the current human lifespan with things like a difference in diet, a water vapor canopy protecting humans from radiation, or just straight-up divine influence; man was originally meant to be immortal, but the growing influence of Sin fucked that up. Others chalk it up to mistranslations or funny-business with numbers. For instance, some replace "years" with "months", giving Methuselah a more reasonable 78.5 years (though applying this same reasoning to Enoch means he fathered Methuselah at age 5 rather than 165). A marginally better idea is that, for all of the Biblical patriarchs, rather than years, it should be tenths of a year. This would have Methuselah check out at 96.9 years and having Enoch sire him at 16.5 (it also makes it somewhat more reasonable that Noah took a wife at 50 years, rather than 500). There's also a symbollic explanation involving 10, 7, and 8 all having symbolic values, and Methuselah's age is just to have him die right before the Great Flood in order to end a sequence of 10, but it seems like a bit of a stretch to me. A bit of random trivia to close: a wine bottle containing 6 litres is known as "a Methuselah".